Poplar Island, just northeast of Tilghman Island on Maryland’s Eastern Shore, is an otherworldly place. What largely comprises the island today is the result of an experiment of both environmental restoration and engineering on a grand scale. By the 1980′s, Poplar— an island that had once sheltered colonial settlers, farmers, hunters, and, as a Democratic retreat, presidents— had eroded away from 1,100 acres to just under ten. The rapid retreat of the shoreline displaced terrapin, shore birds and other species as well as humans from the island. Washed away by a hungry tide, the island was close to disappearing entirely. In the 1990′s the state proposed a radical scheme- to restore the island with dredged materials. The concept was a boon for environmentalists, who mourned the loss of critical Bay habitat, and also for engineers who needed to keep the shipping access to Baltimore open. Construction began building in 1998, and the fragments of remaining island were built up with dredge spoils removed from the shipping channels approaching Baltimore. These materials were allowed to thoroughly dry, and were then planted with native grasses and shrubs. In this fashion, whole swathes of Poplar were reconstructed, one stage, or ‘cell,’ at a time. Today, Poplar is a work in progress, but whole areas of the island have been restored—providing a glimpse of what the project might achieve by its completion date in 2031. Osprey nests stand sentinel over low, grassy meadows and scrubby upland islands where egrets crest on updrafts. Cormorants parade on a sunbaked shoal, their acidic droppings having scorched the soil into grasslessness. As the island has been recreated in stages, one region may vary wildly from the ones surrounding it. 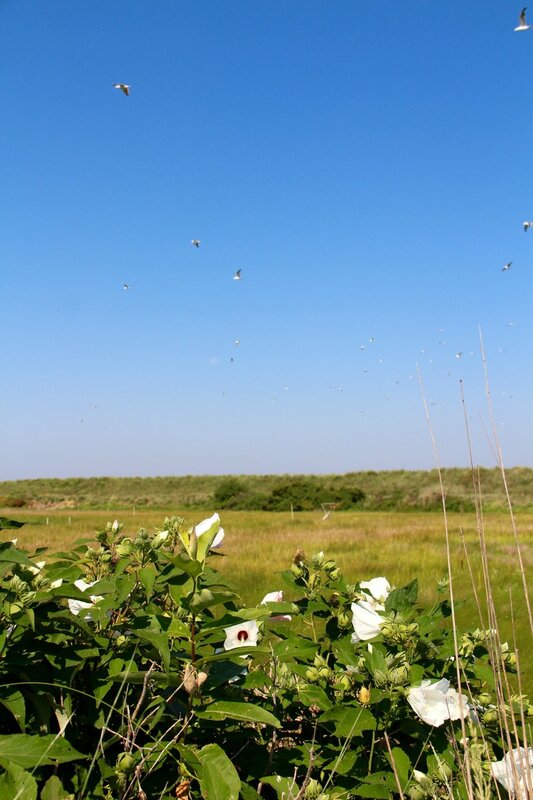 In one cell, blooming marsh hibiscus as white as debutante dresses relieve a landscape of green. Just alongside it, dredge spoils crack in the sun on a newly-created moonscape of soil. It’s an environmental transformation on a monumental scale, slow enough to allow visitors to appreciate the behind-the-scenes atmosphere of an island in progress, but fast enough to see the changes from one year to another.